Edmonton artist Royden Mills was commissioned to create a public artwork for the Terwillegar Park Footbridge site. 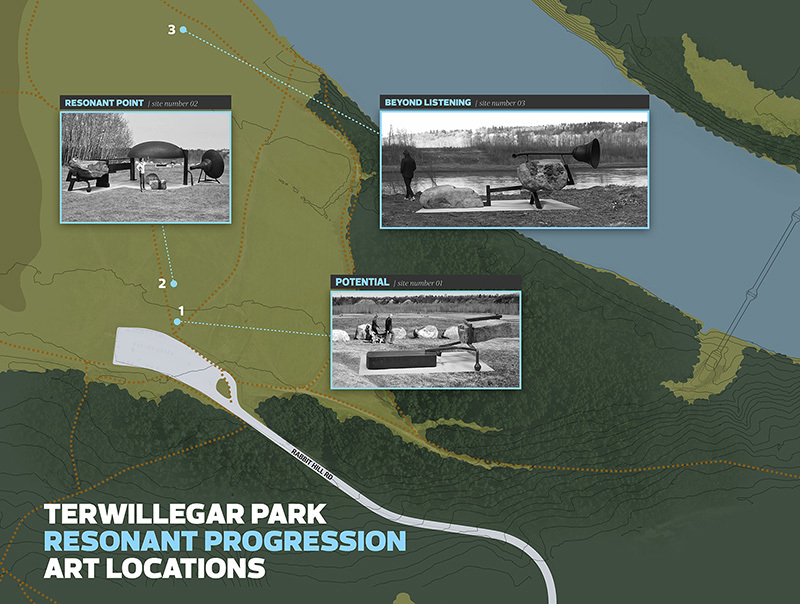 The artwork, Resonant Progression, consists of three sculptures placed in conceptually linked sites in Terwillegar Park. Entitled Potential, Resonant Point, and Beyond Listening, the sculptures are interactive public artworks that amplify the natural sounds in the park. The three pieces were installed in the field closest to the main entrance of the park in summer 2017. The artworks were created using specially selected boulders to highlight the viewer’s connection to the park’s natural state. “The sculptural components are intended to link the viewer now with a sense of the pioneers that settled Edmonton; the sounds of nature around them, and an invitation to slow down and simply listen to the pace of nature around them,” explains Mills. The total commission for the artwork is $126,400. More images of the artwork are available in the Terwillegar Park public art photo gallery. Learn more about the art piece Resonant Progressions. Edmonton artist Royden Mills is a sculptor, visual artist, and educator. He continues to work and teach in Edmonton – most notably as a lecturer at the University of Alberta. His work can be seen locally and internationally. Learn more about Royden Mills. Public Art is an important part of a city — it contributes to the attractiveness and identity of a city and demonstrates the character of communities. As part of the Percent for Art Program, public art will be included as part of the River Valley Alliance project.